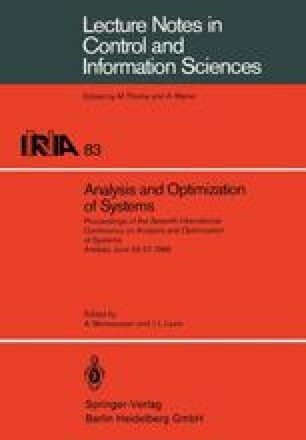 This report deals with the problem of guaranteed estimation of the state of a distri-buted system on the basis of available measurements. The disturbances in the initial dis-tribution, in the system inputs and in the available observations are assumed to be unk-nown in advance. No statistical information on these is given and it is only the restrictions on the possible realizations of these functions that are taken to be available. The inverse problem which arises here therefore reduces to the description of the “informational set” of all solutions that are consistent with the system equation, the available measurement and the constraints on the uncertainties. A minimax guaranteed estimate U° (θ, ·) similar to the “Chebyshev center” of a given set may then be specified, which coincides, in the case of quadratic integral constraints, with the regularization introduced by A.N. Tikhonov for treating ill-posed inverse problems of mathematical physics, .